The Trouble With Stevia - the study I mentioned in this episode is actually from 1968, but this blog post has a lot of good info in it that is more current. Dr. Peter Attia's blog - How Did We Come to Believe That Saturated Fat and Cholesterol Are Bad For Us? Brown Rice vs. White Rice from Cassy Joy of Fed & Fit. 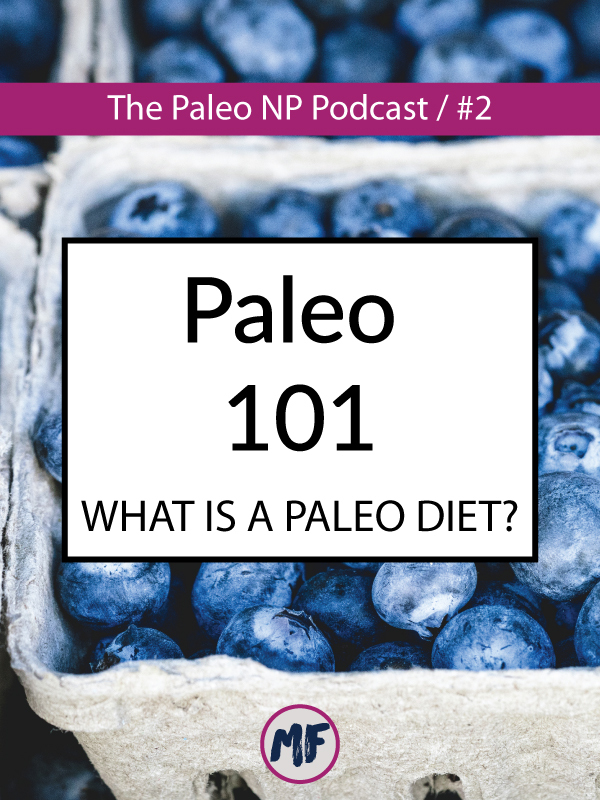 You’re listening to the Paleo NP Podcast, episode #2. Hey everyone, so happy to be back here for episode number two of the Paleo NP Podcast! Today’s episode is all about Paleo 101, but I also quickly wanted to mention that next week I’ve got a guest to bring on the show, so I’m really excited about that, so be sure to catch that episode next week on Thursday! To jump into this week’s topic, I realized the other day that a lot of people have probably heard of the Paleo diet, but they might not actually understand what it means (they think it’s an all meat diet or something like that). So I thought I would talk about that today since so much of what I do and how I work with patients and clients stems from some of the principles related to the paleo diet and the way of thinking that goes along with it. I also wanted to do this episode to help out those of you who may follow a Paleo diet but who maybe don’t understand why some people choose to include certain foods or food groups that aren’t technically Paleo or even those of you who may be struggling with implementing a paleo diet. Now, to clarify one very important thing right from the start, when I say diet I do not mean a short term change in eating to reach a certain goal (if I do use the word in that context, I’ll clarify for sure), I mean the way that you eat every single day. I mean YOUR diet, as in the foods you eat to fuel yourself, because that’s what food really is (and I think something that we easily forget). Food is fuel. Your diet is your fuel. I’m also hoping that this will help those of you who struggle with family or friends who don’t really understand why you choose to eat or not eat certain foods and perhaps aren’t the most understanding about it. I’m hoping you can share this episode with them and it will maybe help them understand a little more where you are coming from and why you are eating a certain way. My other hope is that for those of you who are looking to make changes for New Year’s that this might spark some, for lack of a better word, sense as far as not doing something super extreme (although Paleo feels pretty extreme to people) or short term for a “quick fix,” because there really are no quick fixes. Or for those of you who have found success with Paleo and want to help your friends you can share this episode with them along with the success that you’ve had. Because, as I think it’s Robb Wolf says, try it for 30 days and see if it works for you. Because if it does, then maybe after just 30 days your life will be better, but if it doesn’t, you really haven’t lost anything because 30 days isn’t all that big of a deal and it won’t do any harm. But if it does work for you, you’ll see a huge improvement after just 30 days. I think I first need to start with my paleo journey, which isn’t a huge story of transformation like it is for a lot of people, but it’s important and valuable nonetheless. I first found paleo after I read Animal, Vegetable, Miracle by Barbara Kingsolver and realized that food quality was important. After that I started doing research about how the food you eat and the quality of the food you eat can affect your health and I stumbled on this thing called the Paleo diet. This was in 2009, so it was definitely not as popular or well-known as it is today. I started to transition myself off grains, gluten, and dairy and while I didn’t really notice anything dramatic happen when I stopped eating those things, I did notice how terrible I felt when I DID go back to eating those things. I always thought that I had a dairy sensitivity, which I do, but I after going paleo I realized that the bigger culprit for my occasional stomach aches was soy. Also, in the spirit of full disclosure, I’ve learned how much of certain non-paleo foods I can tolerate. Because I’m not 100% paleo all the time, although I try to do the best I can. I know that if I don’t eat gluten for several months, I can have one or two things with gluten in them over the course of a few days and not feel terrible. The same goes for dairy. I think this lesson has been one of the most valuable because it allows me to not get stressed out over my food choices. If I am somewhere that I can’t find a good gluten-free option (those places do still exist, even if all you are looking for is a piece of meat and some veggies - this happened when I was traveling this past summer and was in Connecticut. We were eating out and there were nothing but sandwich shops and pizza places around - and after eating 2 or 3 salads in a row for meals, it just becomes not such an appealing option), but I now know that if I were to eat a slice of pizza, I won’t feel awful (I might not feel as good as I did if I didn’t eat the pizza, but sometimes you just need to weigh risks and benefits). Anyway, all that is to say that for me it’s been a huge experiment in how GOOD can I feel. Which is pretty darn good. And that is always illustrated for me when I start letting too many treats and exceptions slip back in (it happens to everyone, don’t worry about it!) which helps me to clean things up again and get back to eating what makes me feel good. The other piece of this for me, which may not be quite as relatable for a lot of folks out there is athletic performance. Now, I’m not a great athlete by any means, but I do enjoy my half marathons, 50K ultra runs, and triathlons even though the “paleo” thing to do is to say no to endurance sports. I’m not a crossfitter although I do strength train. I actually believe that this way of eating has helped me be able to continue to do these sports without any injuries. I’m better fueled (as in, I can go longer between meals and need less fuel during races) than my non-paleo friends. As I said before, the whole paleo endurance athlete thing is not super common - at least not amongst those who are paleo authority figures because part of the paleo lifestyle is moving like our paleo ancestors did and they were not running marathons. They were moving relatively slowly for long periods of time, but not running. They lifted heavy things, and they did other functional movements that were a part of hunting and gathering. So that’s where I differ from those folks a bit, but I’d be a hypocrite if I said that you should or shouldn’t do certain things because they do or don’t fit into a paleo framework, because I don’t fit into a paleo framework. But anyway, paleo endurance athletes kind of go against the grain in the paleo world, so if you want to talk more about that you can email me or submit a podcast question. Alright, let’s get into some of the good stuff here. Before I dive in, though, I want to say that your feedback is really important here because I’ve been paleo for so long that sometimes I forget what is or isn’t important or challenging during those first few months of transition. So, if something isn’t clear, or I just leave you with more questions, please email me or reach out on IG (I’ll put links to all of the ways to get in touch with me in the show notes) so I can clarify! So, what is the paleo diet? It is a whole foods diet where we only consume the most nutrient dense food as well as foods that are linked to positive health effects such as being anti inflammatory, providing the body with the macro and micronutrients it needs, eating foods that are healing, and protect gut integrity. And gut health is one of the most important parts of a paleo diet - we should be eating foods that will heal the gut and reduce inflammation in our bodies. Inflammation is tied to almost every health issue you can think of. So when you eat a paleo diet you heal your gut, you reduce inflammation in your body, and you can see improvements in almost every health condition that exists. Inflammation is the root cause of cardiovascular disease, it’s involved in diabetes, it plays a role in cancer, asthma, allergies, high blood pressure. So, almost any disease can be linked to inflammation in your body and pretty much any disease can be improved by following a paleo diet because it tackles the very basic physiology that is behind so many of these health conditions. Especially those that are considered to be diseases of modern civilization meaning that 100+ years ago they either didn’t exist or were not very common - things that are related to high sugar consumption, high gluten content foods, high processed food consumption, eating on the go, lack of sleep, and our overall stressful lifestyles. All of these things are tied together and the paleo diet can BENEFIT everything. It can be fantastic for losing weight if you have weight to lose. And I think something really important to understand here is that we are generally a fat phobic society. The common knowledge seems to be that fat makes you fat, and people come to the paleo diet and use a low-fat approach, which is certainly better than the SAD, but you’ll probably find that you are more satiated with a higher fat, lower carb approach. So when you remove the inflammatory foods from your diet your body and immune system are not longer busy making inflammation, and it can go battle other things, like a cold or a flu virus so you might even find that you go longer between illnesses. One of the leading causes of heart disease isn’t actually high cholesterol, it’s inflammation, but modern medicine doesn’t really know how to address this. A paleo diet is a whole foods diet, we eat real foods that are anti-inflammatory and healing and provides all the nutrition that our body needs for optimal health. It is a diet that is known to heal and reverse a huge variety of health conditions. And this is one of the root causes of disease. When things leak out of your gut and into your body, because what is inside your gut is technically outside of your body, and 80% of your immune system is in your gut, you cause inflammation. Because there are things in your gut that should not be in your body. So when you open up holes by consuming foods such as grains, you cause inflammation and in some people that inflammation can become an immune response, which can lead to autoimmune disease. I talk about this in much more detail in my ebook The 30 Day Energy Reset, which I’ll link in the show notes, but you can also go to 30DayEnergyReset.com to learn more (that’s the number 30, 3-0 energy reset . com). One of the things I noticed when I removed grains and gluten was that they actually didn’t make me feel so great when I ate them. But while I didn’t notice any digestive upset before I removed them, that’s because my body had become so sick and used to eating them that I didn’t even notice how they made me feel, until I removed them and then put them back in. That’s when I noticed things like low energy and digestive upset when I ate certain grains and other foods. I realize this sounds super crazy and hokey to people who aren’t “drinking the paleo kool-ade.” But there are probably thousands of people out there that are saying the same thing about this way of eating. I’ve seen people with something like a plugged ear that has been plugged for years causing them to not be able to hear very well that no doctor can really explain and the only conventional treatment would be to get a dose of steroids, which even then is really only a temporary fix, have complete reversal of whatever symptoms in a matter of days or weeks just by switching to a paleo diet. Almost everyone who switches to paleo has a similar story. If it’s not a chronic health condition, it might just be that silly annoying thing like eczema or joint pain or something that you just attribute to getting older that is annoying but not something that greatly interferes with your daily life, and we accept them as normal, but they aren’t. Especially when doing something relatively like changing your diet can make that all go away.I don’t really love advertising the paleo diet as an evolutionary approach and I don’t like using the archaeological record as the sole rationale for this diet, because it’s really not, which is even why I tend to refer to it as eating a “real food” diet because I think that label causes less of an emotional reaction in people. But really we are going back to a way of eating that pre-dates agriculture, which is where the term “paleo” comes from, it’s short for paleolithic. And while that isn’t a rationale that resonates with a lot of people, it is backed up by modern science regarding the way certain substances that we find in our food affects people and animals, which I think resonates with more people. So, when I say grains and pseudograins, I am referring to: wheat and all forms of wheat (like teff, semolina, and durum), oats, rice, corn, quinoa, amaranth, spelt, sorghum, rye & barley (which contain gluten). So, if you are overwhelmed by this information, one thing you can do as you make this switch is to consider that you can put grains into three different categories. Those that contain gluten and those that do not. So grains that contain gluten are wheat, rye, and barley and if you don’t specifically get gluten-free oats, they can contain gluten as well. And if you are looking for a good place to start, eliminating that entire group of gluten-containing grains is a great place. Just avoid these completely for 30 days. Then there are things like rice. But the lectins in rice is what makes brown rice brown and in terms of gut health, brown rice is harder to digest and more damaging to the gut. So, white rice, teff, and sorghum, and buckwheat are in the category of you should try to avoid it, but if you do eat it, it’s not going to cause the same type of damage that the gluten-containing grains will cause. And then the third category is for corn and quinoa. Fresh corn that you might grow in your garden is completely different from the corn that is found in almost every packaged food in the grocery store. I mean, people with corn allergies probably have it worse than people with any other type of allergy because it’s literally in everything and it’s hard to identify because it has so many different names based on how it’s being processed. So then things like corn or quinoa would be the third category. So if you feel like you are going to die if you don’t have pasta during your first 30, 60, or 90 days you can have something like sprouted quinoa or quinoa pasta. Or eat some fresh corn, because for a lot of people they are just afraid of giving up that carb source. I would highly recommend that you go at least 30 days without all of these grains, but if you just can’t get there, if it’s too tough, then I would say that you should completely avoid group number one, understand that group number two is a different kind of grain that’s not going to cause the same type of gut damage that group number one will cause. And that if you really really needs something, make the right choices, use white rice or quinoa or some sort of quality corn product. I hope that is helpful to people. This is not what I do today, because part of this process is an evolution, but it’s a really solid place to start when you are feeling overwhelmed or scared or whatever you may be feeling about changing your diet. Because there is absolutely no shame in breaking this transition down into little steps. Like first you are going to take all the gluten out of your life, and once you understand what that means and how to do that, you can take the next step by removing all the non-glutinous grains. Everyone needs to go at their own pace, but what I’m trying to help you do here is understand what and why so that you can make your own decisions about all of this. I would also recommend checking out a list of foods that contain gluten that might be a little sneaky - such as things like soy sauce, worcestershire sauce, BBQ sauce, salad dressings, etc. can all contain gluten, so when you are taking that first step and removing gluten from your diet, it can really help to understand where it might also be hiding in less obvious places. I think Diane Sanfilippo over at Balanced Bites has a really good list of sneaky names for gluten and where gluten hides, so I’ll link to that in the show notes for you to look at because it really is helpful. So grains is really the big one, but let’s move on, and I think it will be a little bit easier to talk about these next few. A paleo diet does not include any legumes. Which includes any sort of dried bean (kidney beans, black beans, lentils, split peas), peanuts, and soy - which are really the big ones. Now, legumes where you eat the pod such as green beans, sugar snap peas, and snow peas, those are ok to eat. So, we are really just talking about any sort of legume where you don’t eat the pod. But soy and peanuts are really the most important to exclude. Legumes cause inflammation and can cause a leaky gut. They actually have compounds in them called saponins which beyond causing a leaky gut, can increase inflammation and an unhealthy or out of control immune response. They are called adjuvants - which are also something that are added to vaccines to make sure that your body has a strong immune response to the thing you are being immunized against, but as part of your diet (which you are being exposed to more frequently) it’s really not helpful. Now if you are coming from a vegetarian diet, this is going to sound shocking to you because in my experience most vegetarians eat a lot of beans, soy, and peanut butter as their protein source. So if you are lamenting the loss of your peanut butter, try something like almond butter or sunflower seed butter. So nuts are definitely paleo (because remember, peanuts are not nuts, they are legumes) and they can be used where you might have initially used legumes. Hummus can be another one that is hard for people to give up (chickpeas = legumes), but there are tons of recipes for paleo versions of hummus that use different vegetables instead of chickpeas. So between your nut butters and your other veggie hummus, hopefully you can find a replacement for the loss of legumes from your diet. The other thing to realize while you mourn the loss of your vegetarian protein source is that they aren’t as high in protein as you might have thought and they are really high in carbohydrates, as well as being irritating to the gut, so you might actually be surprised what happens when you remove them. If we are going to prioritize legumes as far as which are the most important to remove and which are the least important - peanuts and soy are at the top of the list for most important to remove and have the biggest body of scientific literature backing up the fact that they are not really all that good for us. Other beans are not optimal and should not be a regular part of you diet, but if you go out for Mexican food and just want to enjoy them once in awhile as a treat, they are not going to cause as much damage to your gut as soy and peanuts and they don’t have quite the same immune impact either. But just like the occasional bowl of white rice isn’t going to be terrible for you, you could also have a serving of beans every once in awhile with no huge negative impact on your health, just as long as you stay away from peanuts and soy. Also, according the the Weston A. Price foundation, soaking and sprouting grains and legumes actually makes them easier to digest and then they won’t damage your gut as much because it removes a lot of the antinutrients. Alright, moving on. A paleo diet does not include any dairy. This can be a little tricky because the parts of dairy that can be problematic for people’s health are the sugars and the proteins, so most people who are eating a paleo diet do include dairy fat in their diets unless they have an intolerance to dairy. But dairy fat that could be included would be butter or ghee (clarified butter), heavy cream, and sour cream. I generally recommend that when you are first starting out on your paleo diet and are doing your initial 30 days, that you remove all dairy from your diet because dairy intolerance is pretty common and the proteins and sugars can be problematic in ways that are separate from an intolerance which is why those are typically omitted from the paleo diet, but the fats can have some great fat soluble vitamins that are hard to get elsewhere, like vitamin K2 which is found in grass-fed butter. But I still recommend that you try no dairy for 30 days and then try to add back in some of the fats. The best way to figure out if you have an intolerance to dairy is to cut it out for 30 days or so and then add some back in and see if you have a reaction. And remember that this reaction is not just digestive symptoms. Some people get skin breakouts or increased and thicker mucous, so it’s important to remember that there are different responses that can happen, but if you are free of all of these things for 30 days and only add back in one thing, then it will be pretty clear if you have a reaction and what that reaction is and then you can figure out how severe that reaction is and how important it is to you that you do or don’t have that reaction. When we talk about dairy intolerances, most people have heard of the protein lactose which gets a lot of attention, but there’s also casein which people can be sensitive to and there’s some evidence that casein can cause behavioral problems in children and removing casein from ADHD and autism spectrum kiddos often improves their behavior. So if that’s something that you deal with in your life, this might be an important consideration. Also for people who are overweight, the proteins in milk actually cause a blood sugar and then insulin spike and that is one of the things I’m going to talk about next is sugar, but one of the things that we do with the paleo diet is regulate blood sugar much better, which is important because too much glucose in your blood in inflammatory and causes oxidative damage to your tissue and too much insulin in your blood (which it needs to get rid of the extra glucose in your blood) also causes increased inflammation. Let’s also just briefly talk about calcium because this is one of the most common things I hear from my patients is, if I’m not drinking milk or eating dairy, where am I going to get my calcium from? And the very important point here is that there are lots of calcium rich foods and dairy is NOT the the only calcium-rich food. The calcium that’s in kale is actually more absorbable and usable by your body than the calcium in milk. Calcium needs to be absorbed in the correct ratios with Magnesium and Phosphorus to be able to build bone and those other minerals aren’t available in milk. You can find more of that in vegetables and meats and bone broths. Also, bone health actually has more to do with the stress from inflammation which ends up leaching calcium from your bones so when you decrease inflammation, you don’t actually need as much calcium. And it also has much more to do with weight bearing exercise than diet, so making sure that you are making something like walking a part of your life is important. For people who are concerned that you need to drink however many glasses of milk per day to keep your bones in order, that’s actually not true and there are some great articles that I’ll link to that can help you feel more comfortable with this idea. So the next point is SUGAR. When you adopt a paleo diet you are cutting out some of the biggest sources of sugar that are part of the SAD. Also I want to point out that when fat, specifically saturated fat, is cited as the source of cardiovascular disease, it’s not actually fat there’s a very strong body of medical literature that shows that fat is not the problem. That too much sugar is actually the problem. So once you cut out wheat you are cutting out huge sources of sugar, but we also cut out refined sugars. So it’s not just the sugar that’s in bread and pasta because we cut out grains, but we also cut out refined sugars like white sugar and brown sugar, we do include unrefined sugars as special treats like date sugar, coconut sugar, maple syrup, or honey and the reason why those are included as a special treat is because those still have the mineral content intact whereas when you just consume white sugar you are basically consuming a pro-inflammatory food with no benefit to your body. So these unrefined sources are still included, but definitely not as part of your daily diet. So I even recommend that people who are used to putting sugar in their coffee get used to not having sugar in their coffee (this is a process you can do very slowly if you need to, decreasing it a little bit every few days until you don’t even notice that it’s gone). And I have also found that a lot of people don’t miss the sugar as much when they add a great fat source like canned coconut milk or heavy cream. So if you are used to drinking your coffee with skim milk and three spoonfuls of sugar or some sort of sweetened coffee creamer, slowly decrease the amount of sugar in your coffee and once you add something like heavy cream or do something like a bulletproof coffee with coconut oil blended in, you probably won’t even miss the sugar. One thing I want to mention about the impact that removing grains and sugars from you body is a quote from the book Wheat Belly by William Davis, he says that 2 pieces of whole wheat toast cause your blood sugar to spike more than a snickers bar. So I think it’s really important to put it in context for you. We also do not replace sugars with fake sugars. So anything that is any kind of diet product is not included in the paleo diet. And that’s because fake sugars can be even more damaging to your health than real sugars. Sugar alcohols are gut irritants. So anything like sorbitol or xylitol. Also, when your body tastes something sweet (and certain people are more susceptible to this) your body will actually release insulin in anticipation of having sugar in your system. And remember that excess insulin causes inflammation, and it really messes things up if your body anticipates that there’s going to be sugar and then there’s no sugar for it to pull out of your blood. This can actually cause increased food cravings. There’s some research that shows that drinking diet beverages that have aspartame can stimulate your appetite and people tend to overcompensate for the calories that they avoid by having the diet beverage by eating more at meals or as snacks because the aspartame stimulated their appetite. So there are people that this is a huge problem for and some people don’t have an issue with it, but it’s just something to keep in mind and be aware of. Also, people are really fond of using stevia as a sweetener because it’s natural and comes from a plant. But the long term effects of stevia haven’t been studied because it’s a fairly new thing and there is some evidence that it may have a negative effect on hormones. I think the study I’m thinking of, which I’ll try to find and link to, showed that stevia had a powerful contraceptive effect in rats. Which might not sound like a bad thing if you are trying not to get pregnant, but honestly, anything that interferes with your hormones isn’t the greatest option. The other thing that people are really fond of are low glycemic index sugars like agave. The reason why these are low GI is because they do not contain glucose, but they do contain fructose. And excess fructose can contribute to inflammation and cause increased cholesterol. And it’s also another sugar source that can mess with your hunger signals and actually make you feel hungrier. The body has a much better ability to deal with glucose and fructose from whole food sources such as fruit than it does a source like agave sweetener. So you can have fruit as a treat instead of something else. Or even a paleo baked good that was make with honey or maple syrup. But remember that these treats, with the exception of fruit, are not meant to be eaten every day. But replacing sugar with fake sugar is not healthy. And there’s no sugar source that will allow you to taste something sweet but will not impact you negatively if you consume it regularly. This is also not to say that you can’t still enjoy your favorite foods, you just have to shift the way you think about them and maybe make them yourself. There are tons of websites out there that have tons of recipes for paleo treats if you need a tasty treat that still fits into these guidelines. One of the things that is kind of an added side benefit of going on a paleo diet is that your tastebuds actually adjust and you end up thinking that what you might have eaten as a treat before is just too sweet and it actually becomes not as enjoyable. I have also found that with some store bought treats, they now have an almost unpleasant or chemical-ish taste to them - it’s kind of hard to describe if you’ve never experienced it before, but food that isn’t what I like to call “real food” just stops tasting good. So I really want to make sure that you aren’t looking at a paleo diet as a place of deprivation because you don’t need to feel deprived. You don’t need to count calories, you don’t need to do anything other than listen to your body and eat real food. And if you are eating real food, it doesn’t take long before your taste buds adapt and that real food is so much more delicious than any of the chemical filled, processed food you can find in the store. So the last part of paleo, is one that is often very difficult for people to grasp and that is returning to animal fat as our sources of fat and avoiding vegetable oils. Vegetable oils are oils like corn oil, canola oil, safflower oil, soybean oil, and they are used as additives as food and used in fast food for frying things. The reason why we avoid these is because they are high in a type of PUFA called omega-6. Now you might see a lot of products that advertise that they are high in omega-3 fats, which are good. And the reason why omega-3s are good and omega-6s are not so good is because omega-3 fats are anti-inflammatory and omega-6 fats tend to promote inflammation. We do need both kinds of fat in our diets. They are considered something called essential fatty acids. But, we need them in balance. So in a paleo diet we aim to have a 1:1 or 1:2 ratio of omega-3 to omega-6 fats which helps to promote healing processes and reduced inflammation. Most of these vegetable oils are extremely high in omega-6 fats. Keeping this balance is pretty easy once you take out the major sources of omega-6 fats in your diet. Now, conventional meat (meat that isn’t organic, pasture-raised, or grass-fed depending on the type of meat) can also be high in omega-6 fats, which is why the paleo diet focuses on getting high quality sources of protein, BUT I always recommend to my patients that they don’t let the idea that you need to eat only organic, grass-fed, pasture-raised meat in order to follow a paleo diet. You’ve got to do the best you can with what you’ve got and if you can’t prioritize that in your budget, eating conventionally raised meat is far better than eating processed junk. Same goes for vegetables. Other major sources of omega-6 fats are grains, legumes, and vegetable oils. Also nuts and seeds have a lot of omega-6 fats in them as well, so while those are completely ok to eat on a Paleo diet, we need to be careful with how much we are eating so that balance doesn’t get too out of whack. Vegetable oils are also not a stable cooking oil, their chemical structure is bent, which is what allows them to be a liquid at room temperature. The less stable a cooking oil is, it is easier for it to be oxidized and damaged which in turn can promote oxidation and damage to your cells. There are a few oils that are stable at room temperature and are ok to use in cooking (but generally at low heats) are olive oil, macadamia nut oil, and avocado oil - all of these are what’s called expeller pressed, so foods that are naturally oily are just pressed to get the oil out vs. the extensive processing that needs to happen to make vegetable oils. These oils are great for making salad dressings and other things that you don’t need heat for, but they can also get damaged at high heats. You can cook with them, but it’s better to do it at a low heat so you don’t damage them. As I talked about earlier, saturated fat gets a bad reputation as the cause of cardiovascular disease. I’m going to link in the show notes to a blog by a doctor name Peter Attia who has written a several part blog post series about the fact that there is no real link between dietary saturated fat and cardiovascular disease and that saturated fat is really important for things like brain function so it’s likely that the increase in mental issues like depression and anxiety that has occured in the last 30 years is related to the decrease in dietary saturated fat that’s been seen since the late 70s. Saturated fat is a very healthy fat to eat because it doesn’t oxidize. Good sources of saturated fat are animal fats - especially grass-fed and pastured raised animal fat because those have the best ratio of omega-3 to omega-6 fats. Coconut oil, palm oil, palm shortening, and butter if you don’t have issues with dairy. So these are all fats that are great to include in your diet. And as I said before, fats are something that your body needs, they are an essential macronutrient. There is also a huge range of macronutrient ratios that you can eat on a paleo diet and still be healthy. Macronutrients are protein, carbohydrates, and fats. And on a paleo diet fat intake can range anywhere from about 30% to about 70% of total caloric intake. One other thing that I want to touch on that’s not specifically related to fats, but is related to macronutrients is how this ratio can shift over time. First of all, you do not need to count calories or follow macros on a paleo diet. If, later on you end up wanting to make some specific tweaks for whatever goals you have, that’s fine, but starting out, just focus on eating real foods. However, when switching from a SAD to the paleo diet you generally see a HUGE reduction in your total carbohydrate intake. Which a lot of critics of the paleo diet will say that it’s a low-carb diet, which it can be, but it’s not intended to be that way. It also depends a little on your perspective, because when you are coming from a SAD to a paleo diet, yeah, it’s pretty low carb. But when you look at the actual grams of carbohydrates you are consuming (which, don’t even worry about that when you are just starting) it doesn’t have to be a “low-carb” diet. I got a question on Facebook about a low carb flu period at first when switching to paleo. So, for those of you who don’t know what a low carb flu is, that just means that when you drastically drop you carbohydrate intake you sometimes experience flu-like symptoms as your body adjusts. But here’s the thing, when you first switch to a paleo diet, you absolutely do not need to experience that, and actually what a lot of people might think is a low-carb flu at first, is actually a sugar detox reaction. So, if you are feeling really lethargic, getting headaches, or having joint or muscle aches when you first switch to paleo, by all means, eat some more carbohydrates, but make sure that they are high-quality paleo sources like fruit or starchy veggies like squash, potatoes, or sweet potatoes. I’ll link to a post from Diane over at Balanced Bites that talks about Paleo and being accidentally low carb, because I think it’s really important that you understand how and why that can happen and prevent it if you don’t want or need to eat a low carb diet. Also, be careful about Paleo Perfectionism (to steal another term from Diane at Balanced Bites) and try to just do your best. The goal is to find a nutrient-dense diet for yourself, but if you need to eat quinoa pasta spaghetti for dinner one night because you just can’t handle another night of spaghetti squash “pasta,” or if your kid isn’t going to eat dinner if you try and feed them zucchini noodles. So long as you understand what the food is that you are eating and what the effect is on your body and everything else about the meal is improved because you are making it at home and using better ingredients and using the right cooking fats and not putting a ton of cheese that’s more plastic than cheese on top of your pasta, then you are FAR better off than you were before. One thing I hear all the time is that “I would go paleo except…” I can’t give up the cream in my coffee or I can’t give up my morning toast, or whatever. Well, then do everything else and don’t give up the one thing that you think you can’t give up because when you finally are ready to give up that one thing that you didn’t think you could give up, you’ll find a way, but it definitely won’t happen until you’re ready and I can guarantee that it will be a whole lot easier after having already made the other changes. But just don’t worry about it for right now, do all the other things and then change the last few things when you are ready. The reason that I recommend this way of eating to almost every single one of my patients and clients is because it will help you have more energy, it will help you to feel healthier, it will help you enjoy your life more because you’ll feel better. And if you feel deprived of whatever food after your initial 30 days, then add the food back in. There are no paleo police that are going to come and bust you because you eat a paleo diet plus white rice (I’ll link to a podcast by Cassy from Fed and Fit about why you should chose white rice over brown rice) if that’s what you need to do to feel satisfied, happy, and healthy. So I challenge you to try paleo for 30 days and see what happens. And if you don’t feel better after 30 days or if something you’ve been dealing with doesn’t improve, I want to know because I pretty much have never heard of that happening. But again, it’s not about being perfect on paleo forever, it’s about doing a little reset and eating paleo the best you can for 30 days and then start experimenting with all the foods that you might have missed and want to add back in. If you need more direction on how to do this, you can check out my ebook, The 30 Day Energy Reset which I talked about earlier and will link to in the show notes. I go over exactly how to go about reintroducing foods after you have eliminated them. I feel really strongly about finding the balance with your diet that works for you. So finding the balance between eating foods that you enjoy and help you to enjoy your life and eating foods that make you healthier and give you energy and resolve health issues. For every person, that individual exists but it also changes over time. The longer you eat a paleo diet, the easier it gets to figure out what to eat and how to find time to cook and it becomes something that is more natural rather than requiring a ton of effort. And when you first start it definitely requires a fair amount of effort to figure out what to eat and what not to eat and so it’s ok to do the best you can for now and work on transitioning slowly. Some people do better with a cold turkey approach but others take months to transition. I encourage you to get a good understanding of what you are eating and how that affects your body and make the changes that are appropriate for you to improve your health. I know that was a ton of information and it might have left you with more questions than actual answers, so if you have questions for me, please submit them via the form on my blog - I’ll link to that in the show notes, or come find me on Instagram or Facebook and ask me your questions! So that’s all I’ve got for you this week. If you enjoyed today’s show, I’d love it if you’d hop over to iTunes and leave me a review. See you next week!